SAN DIEGO, Calif. (CBS 8) - Lindbergh Field is expanding to accommodate 60 more flights a day. Construction is underway in front of Terminal 2 as part of a billion-dollar project called the "Green Build". The airport will use recycled materials and install features that save power and water. 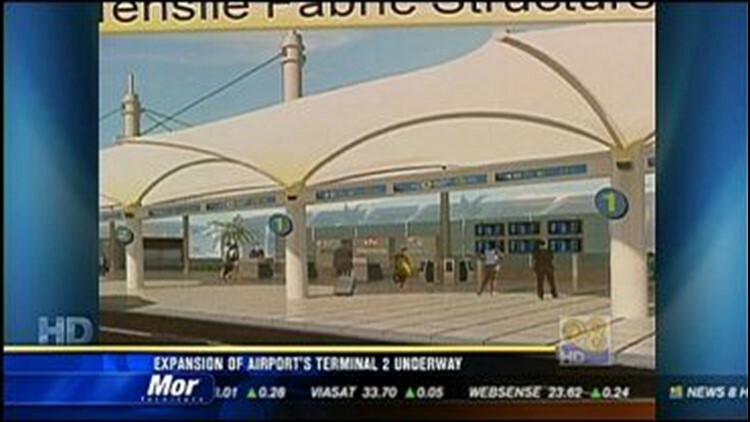 When it's finished in 2013, expect 10 new jet gates, more dining and shopping options and a 12-lane security checkpoint. There will also be a second-level roadway to separate passengers who are arriving and leaving. "We're a $10 billion economic engine for the region and we need to be able to keep up with the growth here in San Diego. And to do that the airport has to expand to be able to handle the transportation needs of the region," vice president of development Bryan Enarson said. The construction is expected to create 1,000 jobs. Money to expand the terminal will come from taxes on plane tickets and rent from airlines and stores at the airport.